OPEC have already said that light sweet crude is in decline. (Only the sour stuff is still increasing in production.) This backs up what Chevron has already stated, the era of easy oil is over. The age of sweet oil is turning sour. 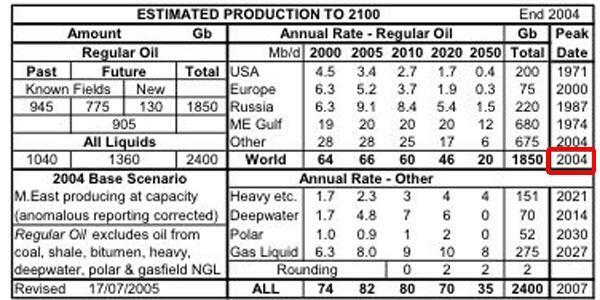 Exxon Mobile have announced that the entire world outside of OPEC is about to peak in its production of all oil categories in the next 5 years. That is a huge announcement. It tells us that we will be dependent on OPEC for any increase in worldwide demand. Once Saudi Arabia have peaked, then that's it — the world has peaked. 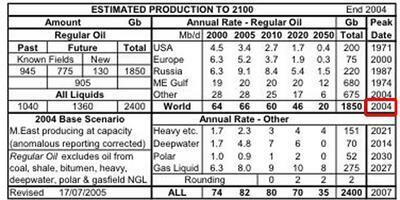 There will be no more economic growth of the oil dependent variety. Indeed, current industrys such as airlines will start to go broke. The New York times quote is from the comprehensive article below. The effective end of the oil age is when we can no longer rely on the ever increasing production of cheap oil. For your average suburbanite, farmer and food distributor, the oil age ends when it costs $500 to fill the car! And all you can do, JD, is to bag the independent oil geologists while ignoring big oil! Hmmm, you are showing up some credibility issues yourself here.